Not Kunxun, but a pile of police puppies in training because d’aww. Earlier this month, a southwestern police department in China received its newest canine trainee. Normally that wouldn’t make the news, except this pup was China’s first cloned police dog, according to Chinese state media. The two-month-old pup is named Kunxun, and is a Kunming wolfdog cloned from a seven-year-old veteran police dog named Huahuangma. Kunxun was cloned via somatic skin sample on September 12 last year, which was then taken back to Beijing, where an embryo was then implanted into a surrogate beagle. 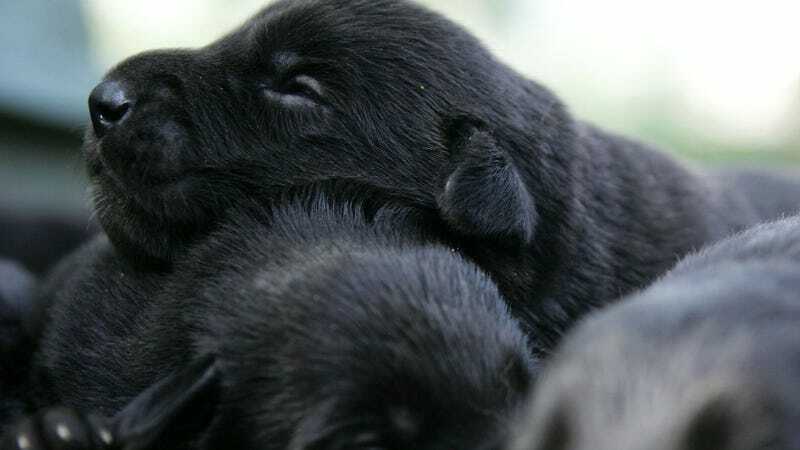 The program itself was set up by China’s Ministry of Public Security and led by Kunming Police Dog Base, Yunnan Agricultural University, and Beijing Sinogene Biotechnology Co Ltd. Sinogene is no stranger to the whole dog cloning business—it’s actually the first biotech company in China to provide pet cloning services. Last year, it also cloned a popular celebrity pup named Juice, and charges about 380,000 yuan or about $55,000 to clone pets. While Kunxun isn’t the first cloned dog, it is somewhat troubling to hear the main reason was to cut down on the time and costs involved in training police dogs, according to Xinhua. According to China Daily, which is an English-language newspaper run by the CCP, police dog training in China takes somewhere between four and five years, to the tune of about half a million yuan. Er. Cool. That doesn’t sound like borderline dog eugenics out of a science fiction movie, at all. Except there’s little reason to believe that a dog’s clone will behave exactly like its parent, even if they share the same genetics. And clones do not, for the record, retain memories from their predecessors. Singer Barbra Streisand famously cloned her dog, Samantha, only to find the resulting puppies had different personalities. In a New York Times op-ed Streisand penned, she admitted that “You can clone the look of a dog, but you can’t clone the soul.” Still, it’s possible that the dog could turn out to be more receptive to training than others. Another potential issue with the idea of cloning “genetically superior” animals for industrial or service reasons, is it’s not exactly clear if cloned animals suffer from accelerated aging. Dolly, the first ever cloned sheep, died at 6 years old, which according to the Smithsonian is half the average age of a regular sheep. But later, scientists found that her cloning origins didn’t contribute to her premature death. Meanwhile, the first cloned dog Snuppy lived for 10 years, but eventually died from the same cancer that killed its parent. There’s currently a study monitoring Snuppy’s cloned offsprings to monitor the health and lifespan of cloned animals. As for Kunxun, she’s just entered training and supposedly, if you believe state media, has shown “good aptitude” on tests for sniffing, detecting, and adapting to unfamiliar environments. Good doggo?